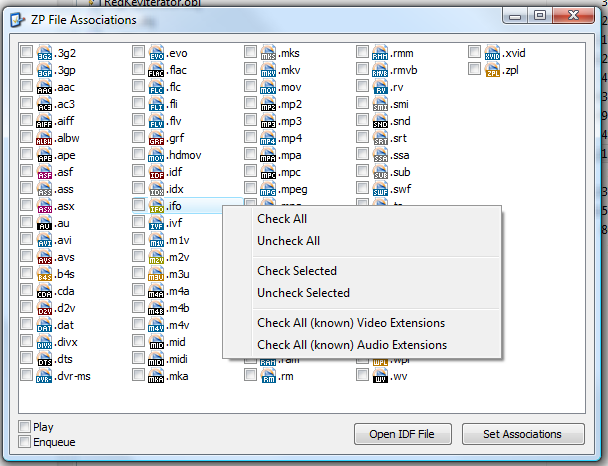 ZP File Associations is a tool to use icon definition files with Zoom Player in Standard Mode under Windows Vista. It works with UAC enabled/disabled or as a standard user. If no icon definition file is specified it defaults to the first icon in zplayer.exe for every extension. You can also define alternative icons to register (doubleclick the extension you want to change). Also adds ZP to open with list. Gives better Win8 compatibility.